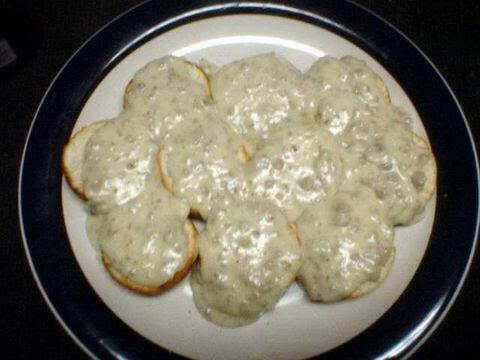 My most favorite breakfast food of all time is biscuits and gravy, hands down. Nothing can compare. We do biscuits and gravy a little bit different here in Kentucky, and these recipes were passed down to me by my grandmother, who cooked everything with either lard or bacon grease. Low-fat? No way! But it is incredibly delicious. This is how my grandmother taught me to make biscuits – the best “Kentucky” way. They’re flatter than some varieties, but they taste every bit as good (or better). Serve with the bacon grease milk gravy for maximum Bluegrass State effect. Mix the flour, baking powder, baking soda, salt, and sugar in a large bowl. Cut in 1/2 cup butter with a fork until the mixture resembles coarse crumbs. Turn out onto a lightly floured surface, and knead for 2 minutes. Transfer to an ungreased baking sheet, roll out into a 6 X 6-inch square, and cut into 12 even sections. DO NOT separate. Bake about 15 minutes, until a knife inserted in the center of the square comes out clean. Separate the biscuits, and serve hot. Heat bacon grease in a skillet over medium heat until liquid. Whisk flour into drippings until smooth. Reduce heat to low and cook the flour mixture until it turns a caramel brown color. Stir constantly for about 15 minutes to prevent burning. Whisk 1/2 cup milk into the roux until well blended. Continue whisking the milk into the gravy, 1/2 cup at a time. Bring gravy to a simmer and whisk constantly until thick, smooth, and bubbling.